I’ve been a Toronto Maple Leaf and enthusiastic hockey fan my whole life, and I’ve never been able to intersect my passion for the sport with my love of geography. As a geographer, I’ve been looking for ways to blend the two together for a few years now, and this geovis project finally provided me the opportunity! I’ve always been interested in the debate about how teams located on the west cost travel more than teams located centrally or on the east coast, and that they had a way tougher schedule because of the increased travel time. For this project, I decided to put that argument to rest, and allow anybody to compare two teams for the 2016/2017 NHL season, and visualize all the flights that they take throughout the year, as well as view the accumulated number of kilometres traveled at any point during the season and display the final tally. I thought this would be a neat way to show hockey fans the grueling schedule the players endure throughout the year, without the fan having to look at a boring table! It all started with the mockup above. I had brainstormed and created a few different interfaces, but this is what I came up with to best illustrate travel routes and cumulative kilometres traveled throughout the year. The next step was deciding on the what data to use and which technology would work best to put it all together! First of all, all NHL teams were compiled along with the name of their arena and the arena location (lat/long). Next, a pre-compiled csv of the NHL schedule was downloaded from left wing lock, which saved me a lot of time not having the scrape the NHL website, and compile the schedule myself. Believe it or not, that’s all the data I needed to figure out the travel route and kilometres traveled for each team! All of this data mentioned above was put into a SQLite database with 3 tables – a Team table, Arena table, and a Schedule table. The Arena table could be joined with the Team table, to get information on which team played at what arena, and where that arena is located. The Team table can also be joined with the Schedule table, to get information regarding which teams play on what day, and the location of the arena that they are playing. Because I wanted to allow the user to select any unique combination of teams, it would have been very difficult to pre-process all of the unique combinations (435 unique combinations to be exact). For this reason, I decided to build a very lightweight Application Programming Interface (API) that would act as a mediator between the database and the web application. API’s are a great resource for controlling how the data from the database is delivered, and simplifies the combination process. This API was programmed in Python using the Flask framework. 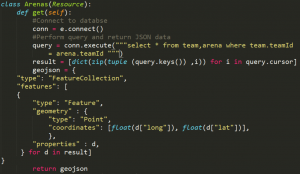 The following screenshot shows a small exert from the Flask python code, where a resource is set up to allow the web application to query all of the arenas, and will get back a geojson which can be displayed on the map. To create the animation, the web application sends a request to the API to query the database for each team chosen to compare. The web application then loops through the schedule for each team, refreshing the page rapidly to make a seamless animation of the 2 airplane’s moving. At the same time the distance between two NHL arenas is calculated, and a running total is appended to the chart, and refreshed after each game in the schedule. The following snippet of code shows how the team 1 drop down menu is created. After everything was compiled, it was time to demo the web app! 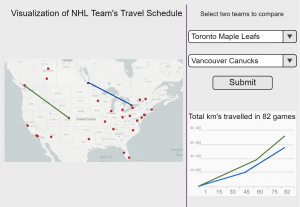 The video below shows a demo of the capability of the web application, comparing the Toronto Maple Leafs to the Edmonton Oilers, and visualizing their flights throughout the year, as well as their total kilometres traveled. To get a more in depth understanding of how the web application was put together, please visit my Github page where you can download the code and build the application yourself!